Call A to Z Entertainment, Inc. today for free information about how to hire or book country music singer Tyler Stephens. 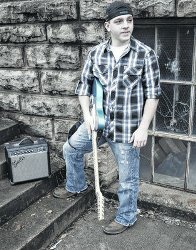 We are your best agent and talent agency for booking and hiring country musician Tyler Stephens! We also help you plan and produce your show or event, so call us today at 888-655-4575 and we’ll be happy to help you. For those of you who don’t Tyler Stephens, honesty, hard work, and dedication would be three words to sum him up. Tyler believes that life is a hard lesson learned and it’s the little things in life that mean the most. Tyler Stephens lives in the beautiful mountains of Southeastern Kentucky, only minutes from the well known Country Music Highway, US 23. This area is known for turning out country music greats such as Keith Whitley, Billy Ray Cyrus, Dwight Yoakam, Loretta Lynn, Patty Loveless, and Ricky Skaggs. Tyler Stephens was introduced to music at a very early age. As a child of the early 90’s, Tyler knows real country music. His grandmother claimed that keeping a stereo player in the house during Tyler’s childhood was impossible. At only 3 or 4 years old, Tyler would visit his grandmother’s place daily to “punch the buttons” on the cassette player. But, “punching buttons” led to strumming the guitar or should we say, ‘beating’ the guitar. Tyler’s mother claimed she is lucky to have hearing left. She reported that over the years, Tyler has ‘had every instrument imaginable in the house…drums, bass, electric guitars, acoustic guitars, banjo, harmonicas, and who knows what else. But the guitar always seemed to wind up on top. She says at first she needed earplugs, but over time, and in Tyler’s high school years she began to see the improvements that eventually surprised her when she saw Tyler perform his first actual show with a band. Now at only 20 years old, Tyler has set his sights on a successful musical career and never plans to look back. With countless performances behind him and opening for many country headliners, Tyler looks forward to sharing his songs and love of music with fans for many years to come. If you love country music then you owe it to yourself to check out its newest rising star- Tyler Stephens. We can help you book and hire any live country music bands and country singers. We’re your best agent and agency for booking and hiring country music singer Tyler Stephens, so call 888-655-4575 to check for available dates. We are not the exclusive agency for any live entertainers on this site.